Prevent burns and give yourself a longer reach when accessing the oven. This clever little tool is over 13" long and allows you to push in or pull out your oven rack with ease. It is one of those tools that you never knew you needed, but can't live without once you get used to it. 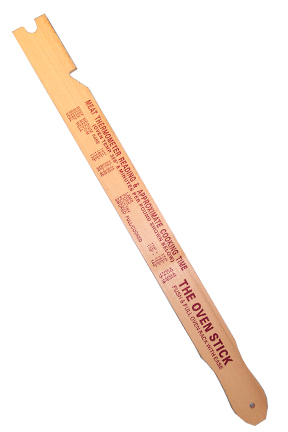 With The Oven Stick, you are not forced to fumble with flimsy pot holders and mitts that can be too small, or too thin, and you are able to stand farther away while adding or removing food from your oven. This will prevent the overwhelming burst of hot air in your face, and all but eliminate any chance of coming into contact with a hot surface while baking. For shorter folks out there, this tool can become essential because reaching over the door every time can be quite difficult, and sometimes dangerous. Since your arms, face, fingers and hands will be a safer distance from the rack, you are not risking being burnt like you do with standard mitts and holders. Thanks to the simple yet effective design, this tool can be a quick solution that makes pushing in, or pulling out the oven rack easy. You can even use it to hook a dish that has traveled to the back of the oven to quickly pull it forward without sticking your whole arm in the oven. Using The Oven Stick is incredibly simple. It is essentially a 13.5" wooden stick with two notches in the end. It also has a handle carved into it and an integrated hanging hook for storage when not in use. You can also just toss it in a drawer due to the rugged and long lasting material. When using The Oven Stick, you will position the rack edge in the front notch to push it in. In order to pull a rack out, simply hook it with the lower notch and pull towards yourself. Each gripping notch is perfectly shaped so it won't slip, but is easy to remove from the rack once you are done. The lower notch is large and versatile enough to also hook the edge of metal or glass baking dishes. Since rack thickness is fairly universal, this tool should work with any oven. Simply hook and slide for the easiest, safest and most convenient way to push in or pull out an oven rack. This tool is perfect for anyone with arthritis or strength issues in their hands. It is also ideal for those with mobility issues too because it allows for less bending and stretching while using the oven. Although perfect for these types of people, anyone can benefit from this tool because it will increase efficiency, make cooking safer, and allow the user to stay farther away from the oven when putting food in or removing it. An added benefit is improved posture while baking or cooking since there will be less bending involved in retrieving that dish. This tool is a must have for anybody that bakes or broils regularly, and is truly awesome for those times when you are cooking a roast or turkey and have to check and/or baste often. Use The Oven Stick to pull the rack out a bit, then hook that big old basting pan to pull it towards you. After that, simply baste or check temperature normally, then use the tool again to push the dish back and return the rack to its place. 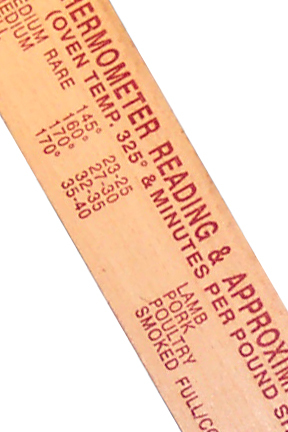 Refer to the measurements on the side to see cooking times for common meats. Order Yours Today! Dimensions 13.75" x 2.15" x .25"
Hangable Yes. Integrated hanging hole in handle. 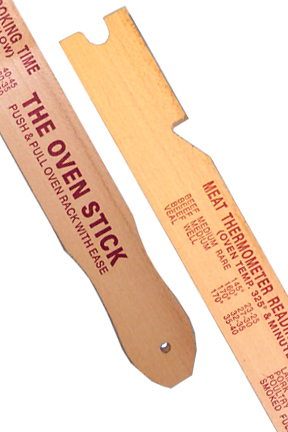 The Oven Stick - Prevent burns and pull out your oven rack without getting too close. THis long stick can hook to pull or grab on to push. Get food out of your oven safely and conveniently. Order Yours Today! great product. easy to use and very convenient. will purchase more for gifts.